I mostly like this book. But I have significant qualms about it too. First, it reflects the unbiblical notion that only men can be called as pastors. This is clearly not the case. Second, I feel the book is ungracious toward alcoholics and others who are given the option of grape juice instead of wine at Holy Communion. While I believe that when the Bible says "wine," it means "wine," I think that the grace of God compels us to share grape juice with people who, whether they are alcoholics or have other health issues, cannot drink wine. I have the feeling that Jesus surely commends graciousness toward those who are genuinely present and believe in His real presence in, with, and under the elements. Qualms aside, I thoroughly enjoyed this book. Except when it wanders off into these legalisms and culture-think, it presents sound Biblical counsel on the necessity of church membership to the Christian life. 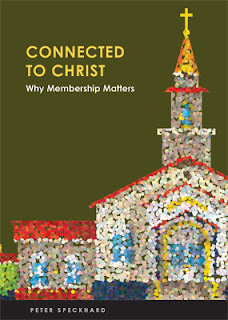 The understanding of membership here is, healthily, not about occupying a spot on a roster, but about being an indispensable member of the body of Christ, as taught in the Bible and in the Lutheran Confessions. The author understands the pitfalls and the challenges of living in a church community. In the last chapter, especially, he underscores the fact that these pitfalls and challenges have always been part of the life of the Church and always will be as long as congregations are composed of sinners saved by God's grace through their faith in Christ. With lots of accessible metaphors and analogies, Speckhard honestly (and sympathetically) grapples with the reasons non-churchgoing people give for staying away from the church. This is a short read and worth your time, though it would not be a good resource for congregational study and reflection; its biases get in the way too often for that. Here are thoughts from my time with God today. To see how I approach this "quiet time," see here. It seems that Jude, the brother of James, had wanted to talk about the Gospel alone as he wrote to his correspondents. But false teachers had arisen among the Christians in the community where the recipients of this letter lived. Jude felt the need to warn them to stay away from their false and sinful teaching (v.3). Here, Jude talks about what needs to happen as we wait to see Jesus. Jude had in mind the return of Jesus, seeming to assume that it would happen in his and his first readers’ lifetimes. But, of course, we all are going to meet Jesus when He returns to the world, whether we’ve been long dead or are still living on earth when it happens.. So, the question Jude answers is how are we supposed to live our lives until we meet Jesus? Listen: First, Jude says, we need to build ourselves up in the faith. Our faith is also built up when we regularly receive the body and blood of Jesus, the Word imparted in, with, and under the bread and wine of Holy Communion. In this sacrament, Jesus promises to meet us, to forgive us our sins, and to to give us His very good and perfect life. In it, we are “remembered” to Jesus in the company of the congregation in which we receive it and in company with all the saints of every time and every place, in eternity and on earth. I’m convinced that most of the “praying” I’ve done and, sadly, still do, is offered in the power of my spirit instead of the power of the Holy Spirit. By that I mean that I try to tell God exactly how He should answer my prayers. Or, I pray, all the while scheming out how I would or will answer the prayer. When I’ve done these things, I likely haven’t been praying at all. To pray by the power of the Holy Spirit is to pray with complete submission, an acknowledgement my powerlessness and that God knows best how to address whatever it is that I bring to Him. You say, “Your will be done” and mean it. Ole Hallesby teaches about prayer in his book, Prayer. Authentic prayer is composed of two elements: faith and helplessness. If I’m not helpless when I pray, then I’m getting in the way of God working. I harbor the secret belief that I know what’s best and God is only a backup insurance policy. But I must own my weakness and let God’s strength take over: “...when I am weak, then I am strong” (2 Corinthians 12:10). These are the two ways we can prepare to meet Jesus identified by Jude: (1) Growing in our faith; (2) Praying in the power of the Holy Spirit. Respond: Lord, I try to do too much, think too much, be too much in my own power. I try to think my way through, feel my way through. All of this is the wrong path to my meeting with Jesus. “There is a way that seems right to a man, but its end is the way to death” (Proverbs 14:12, English Standard Version). “The heart is deceitful above all things and beyond cure...” (Jeremiah 17:9). Help me to be ready to meet you each day (Matthew 25:31-36) and at the judgment by growing in faith and praying--humbly, openly, submissively--in the power of Your Holy Spirit and not in my own mortal, sinful power. Today, help me to accept Your will. I'm no MacGyver, but it even appeals to me. Here's the audio from this past Sunday's message for Christ the King Sunday, the last Sunday of the Church Year. The text is Matthew 25:31-46, in which Jesus describes the judgment over which He will preside as King of kings on the day of His return to the earth. The gospel lesson for this Christ the King Sunday is a passage that can be and often is misunderstood. In it, Jesus talks about the great judgment that He, the King, will bring to all the people on the Day of His return. Many think that Jesus calls people righteous and worthy of HIs kingdom in this parable because they saw Jesus in people in need and did good things for them. But that’s not what Jesus is saying. He’s not saying that you and I have to prove to Him what wonderful Christians to get into heaven. Jesus is not saying that your good deeds will make you righteous. The Bible tells us that we are all unrighteous (Romans 3:10). God’s Word also tells us that the “wages of sin is death” (Romans 6:23). If we’re going to enter God’s eternal kingdom, it won’t because our good deeds outweigh our sin. So what is Jesus telling us this morning? But it’s evidently a characteristic of people who follow Jesus that they’re not aware of the good they do. They don't even recognize the good things they had done. They don’t see themselves as better than others. They’re too busy seeing Jesus in other people to think about how God sees them. The people fit for Jesus’ Kingdom aren’t those who set out to become righteous by what they do; they do what they do because they have already been made righteous by God. They simply and trustingly believe in Jesus. They're the people who know that Jesus bore all of our sins, making it possible for all who trust in His righteousness and not their own to enter eternity with God. Of course, there’s another group of people in our parable. They’re the people who think of themselves as good people. 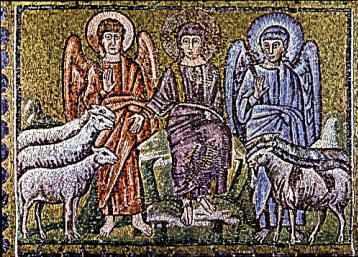 Jesus says that they’re goats, not lambs. The “goats” are surprised when the King Jesus tells them that they are “cursed,” unworthy of His Kingdom and then sends them to “the eternal fire prepared for the devil and his angels” (verse 41). He says that, unlike the “lambs,” they had neglected to serve Him when He was hungry, when He was thirsty, when He was in jail, when He was sick. In verse 44, the goats ask when they ever saw the King in these conditions. These people apparently knew about Jesus but failed to trust in Jesus and so, were spiritually dead. Their spiritual deadness led them in turn to be blind to the Jesus that we can see every day if we will just look. 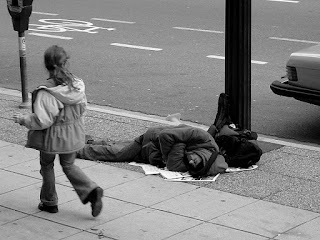 In the tired department store clerk or restaurant server, if we look, we will see a weary Jesus in need of our service. In the co-worker weighed down by personal problems, the classmate being bullied, the homeless man at Saint Vincent’s, the friend grieving a recent loss, a family member with whom we have disagreements: In them all, if will look, we can see Jesus. In every person. We will see that they all bear God’s image. We will see that they all bear the weight of human sin, including the sin that has been committed against them. When we believe in Jesus, when we lay our sins at the cross and receive the forgiveness that God confers on those who humbly trust in Christ, God will help us to see Jesus everywhere we go. And, grateful for His grace, we will, without self-consciousness or conceit, self-promotion or human prompting, be the faithful subjects of Christ our King. We do the work of God when we let God work in us and on us and through us. It isn’t our work that saves us or makes us right with God; it's the One at work in us, remaking those who trust in Jesus over in Jesus’ image, Who saves us. The righteousness that comes from faith! That's what the people welcomed by Jesus into His Kingdom possessed. So, by faith, take Jesus again today in His Word and in the Sacrament. Trust His promise to meet You in these things. Trust that He is with you always, just as He has promised. Let Him live in you. Don’t try to prove what a wonderful Christian you are!